A small piece of DNA with a thymine dimer (magenta). Summer is here, and we're all heading outdoors to enjoy the sun. But remember to take your sunscreen, since too much sunlight can damage your cells. Small doses of sunlight are needed to create vitamin D, but larger doses attack your DNA. Ultraviolet light is the major culprit. The most energetic and dangerous wavelengths of UV light, termed UVC, are screened out (at least for now) by the ozone in the upper atmosphere. However, the weaker UV light, termed UVA and UVB, passes through the atmosphere and is powerful enough to cause chemical changes in the DNA. Ultraviolet light is absorbed by a double bond in thymine and cytosine bases in DNA. This added energy opens up the bond and allows it to react with a neighboring base. If the neighbor is another thymine or cytosine base, it can form a covalent bond between the two bases. The most common reaction is shown here: two thymine bases have formed a tight thymine dimer, with two bonds gluing the bases together. The upper image is from PDB entry 1n4e and the close-up picture at the bottom is from PDB entry 1ttd . This is not a rare event: every second you are in the sun, 50 to 100 of these dimers are formed in each skin cell! These dimers are awkward and form a stiff kink in the DNA. This causes problems when the cell needs to replicate its DNA. DNA polymerase has trouble reading the dimer, since it doesn't fit smoothly in the active site. TT dimers like the ones shown here are not the major problem, since they are usually paired correctly with adenine when the DNA is replicated. But CC dimers do not fare as well. DNA polymerase often incorrectly pairs adenine with them instead of guanine, causing a mutation. If this happens to be in an important gene that controls the growth of cells, such as the genes for Src tyrosine kinase or p53 tumor suppressor, the mutation can lead to cancer. Repair enzymes T4 endonuclease V (left) and DNA photolyase (right). We spend a lot of time in the sun, so it will come as no surprise that we have a powerful mechanism for correcting these problems. Our cells use a process called nucleotide excision repair, which requires the concerted effort of a large collection of proteins that recognize the corrupted bases, clip out the section of DNA with the error, and then build a new copy of the damaged area. Other organisms have additional correction mechanisms. For instance, the enzyme on the left (PDB entry 1vas ) is an endonuclease that clips out the damaged bases, making the site available for repair. Surprisingly, this endonuclease doesn't recognize the thymine dimer directly. 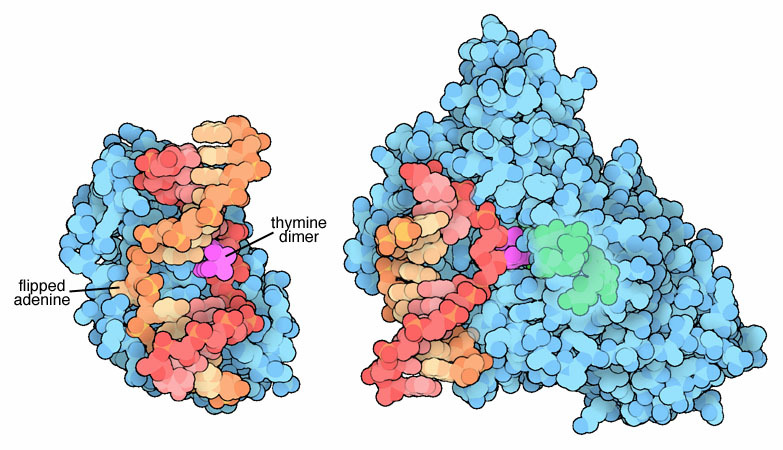 You can see in this picture that the thymine dimer (colored magenta) doesn't touch the enzyme at all. Instead, the enzyme recognizes one of the adenines that is paired with the dimer. Since the base pair is weakened by the contorted shape of the dimer, the adenine is easily flipped out and bound to a pocket in the enzyme. The enzyme on the right (PDB entry 1tez ) is a photolyase that directly breaks the bonds connecting the dimer, correcting the error in place. Ironically, photolyases use visible light to power this process. This structure captures the DNA after the thymine dimer has been fixed. 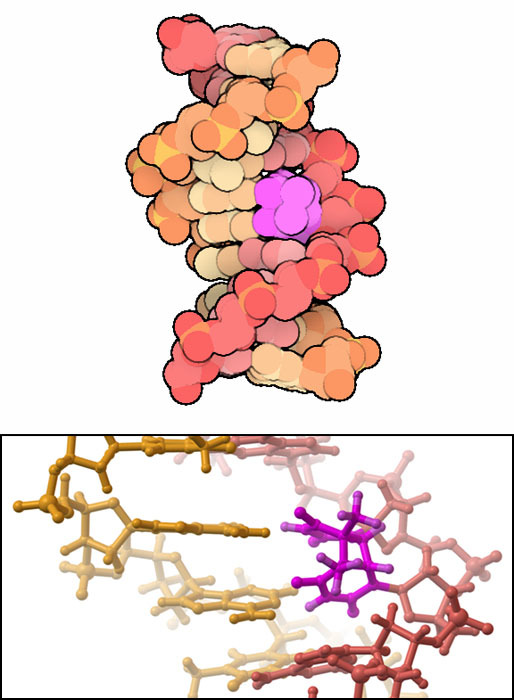 Notice that the two thymine bases (colored magenta) are flipped out of the normal DNA helix and are bound in a pocket on the enzyme surface. Most DNA polymerases have a hard time replicating DNA with pyrimidine dimers. 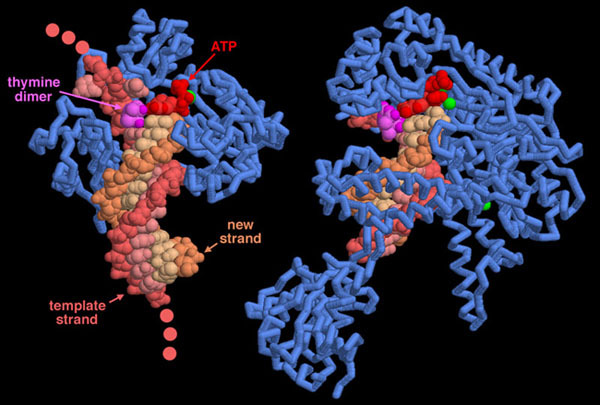 The enzyme on the left, from PDB entry 1rys , is an exception: it is designed to read through damaged DNA. It has a loose active site, so it can easily accommodate the stiff thymine dimer. However, this open active site makes the enzyme rather prone to errors. A more typical DNA polymerase is shown on the right, from PDB entry 1sl2 . It tightly enfolds the DNA, and because of this close contact, is very accurate in copying the DNA. However, it has a lot of trouble with damaged bases and works 3,000 times slower on thymine dimers than with a normal DNA. This picture was created with RasMol. You can create similar pictures by clicking on the accession codes here and picking one of the options for 3D viewing. H. S. Black, F. R. deGruijl, P. D. Forbes, J. E. Cleaver, H. N. Ananthaswamy, E. C. deFabo, S. E. Ullrich and R. M. Tyrrell (1997) Photocarcinogenesis: an overview. Journal of Photochemistry and Photobiology B: Biology 40, 29-47. T. Lindahl and R. D. Wood (1999) Quality control by DNA repair. Science 286, 1897-1905.